BRADFORD - The U.S. Claims Court has awarded more than $4.5 million in compensation to a Bradford couple for damage caused to their 3 ½-year-old son by regular vaccinations. David and Colleen Nuzzo of 173 Williams Street will receive the award under the National Vaccine Injury Compensation Program for rehabilitation and care of their son, Andrew Nuzzo. The damages for Andrew were approved April 12 by Special Master Bryan J. Bernstein of the U.S. Claims Court in Washington, D.C. The award is believed to be the largest ever given under the national compensation program. Andrew suffers from chronic seizures and is in need of care 24 hours a day. 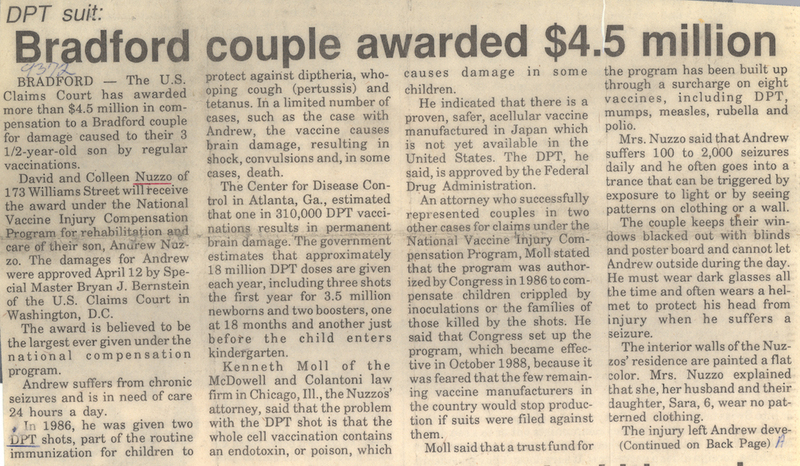 In 1986, he was given two DPT shots, part of the routine immunization for children to protect against diptheria, whooping cough (pertussis) and tetanus. In a limited number of cases, such as the case with Andrew, the vaccine causes brain damage, resulting in shock, convulsions and, in some cases, death. The Center for Disease Control in Atlanta, Ga., estimated that one in 310,000 DPT vaccinations results in permanent brain damage. The government estimates that approximately 18 million DPT doses are given each year, including three shots the first year for 3.5 million newborns and two boosters, one at 18 months and another just before the child enters kindergarten. Kenneth Moll of the McDowell and Colantoni law firm in Chicago, Ill., the Nuzzos' attorney, said the problem with the DPT shot is that the whole cell vaccination contains an endotoxin, or poison, which causes damage in some children. He indicated that there is a proven, safer, acellular vaccine manufactured in Japan which is not yet available in the United States. The DPT, he said, is approved by the Federal Drug Administration. An attorney who successfully represented couples in two other cases for claims under the National Vaccine Injury Compensation Program, Moll stated that the program was authorized by Congress in 1986 to compensate children crippled by inoculations or the families of those killed by the shots. He said that Congress set up the program, which became effective in October 1988, because it was feared that the few remaining vaccine manufacturers in the country would stop production if suits were filed against them. Moll said that a trust fund for the program has been built up through a surcharge on eight vaccines, including DPT, mumps, measles, rubella and polio. Mrs. Nuzzo said that Andrew suffers 100 to 2,000 seizures daily and he often goes into a trance that can be triggered by exposure to light or by seeing patterns on clothing or a wall. The couple keeps their windows blacked out with blinds and poster board and cannot let Andrew outside during the day. He must wear dark glasses all the time and often wears a helmet to protect his head from injury when he suffers a seizure. The interior walls of the Nuzzos' residence are painted a flat color. Mrs. Nuzzo explained that she, her husband and their daughter, Sara, 6, wear no patterned clothing. The injury left Andrew developmentally disabled, knowing only a few simple words. The award was based on estimates that Andrews' medical and non-medical expenses will cost approximately $67,000 a year as a child and some $102,000 a year as an adult. Although chances are slim of Andrew recovering from the vaccinations, the Nuzzos welcome the money they will receive for therapy and any other help they can give their son. Mr. Nuzzo said that he and his wife would have preferred to receive the award quietly, but they felt that families of other damaged children might be helped by the knowledge of the compensation program. Moll pointed out that while the statue of limitations formerly ran out on older cases, since the compensation act was passed in 1988, all injured parties have until October of this year to seek compensation under the act.